A $15 million environmental cleanup has started on a 1.4-acre brownfield site in South Lake Union. Frontier Renewal, a Denver-based company that specializes in preparing contaminated urban properties for redevelopment, acquired the site in 2010. It is a full-block at 700 Dexter Ave. N., and bounded by Dexter, Roy Street, Valley Street and Eighth Avenue North. SoundEarth Strategies is the environmental consultant. 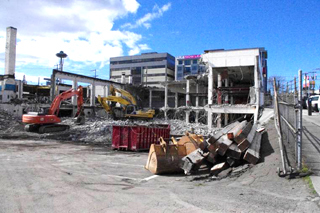 Its sister company, SoundEarth Construction, is completing the demolition and cleanup. The site was the location of Autohound Collision Center and American Linen Supply Co., an industrial dry cleaning operation. According to Frontier Renewal, the site has significant soil and groundwater contamination, including tetrachloroethene, or PCE. Demolition work concluded last month. Primary cleanup is expected to finish during the first quarter of 2014. Offsite cleanup will continue for several years. The onsite cleanup involves drilling probes into the ground and running electricity between them to remove contaminants. Additional groundwater cleanup will be performed by injecting food-grade amendments into the groundwater that are designed to help degrade contaminants naturally. Frontier Renewal plans to sell the site once the cleanup is finished. The firm is preparing the site to be redeveloped for a biotechnology or commercial mixed-use project.